Listen here. I discuss where many of the core ideas of veganism and where they originated. Please note the views expressed in this episode are entirely my own. Listen here. Please note the views expressed in this episode 41, Parts 1 and 2 are entirely my own. I don’t know if you had the opportunity to listen to Bob Linden’s Go Vegan Radio segment live on air on August 21, where he interviews Angel Flinn (media coordinator of the BeFairBeVegan campaign. Angel Flinn by the way also happens to do outreach work for Gentle World. If you didn’t catch the interview live, then you’re in luck because although Bob Linden states on his page that it will be not be available in archive form on his Go Vegan Radio page, we managed to record it as it went to air. My last episode contained excerpts from Angel’s interview and I invite you to listen to it. In this episode I’m going to share the unfortunate and rather seething attack that occurred live on the same Go Vegan Radio program by the guest appearing after Angel Flinn’s interview – Gary L Francione. We thought it might be informative to share the rather vicious attack on Angel Flinn made by Professor Gary L. Francione and I clear up some misinformation in his live segment (7 minutes or so). Tune into Part 2 “And Then Sailed On To New York” where I discuss where many of the core ideas of veganism really came from. If we have spent any time on social media lately we have probably seen much outrage in relation to the hashtag ‪#‎CecilTheLion‬. From what I understand, Cecil was an old lion whom was much beloved in Zimbabwe and who was murdered, decapitated and then photographed by a US citizen who paid many tens of thousands of dollars to get access to him. Why have I raised this issue of Cecil the lion’s murder? Firstly, we need to understand that this murder is not an unusual event. Canned hunting and safari hunting is big business. Have a look online and you’ll see hundreds of photos of people with murdered African animals. Let’s keep in mind that this type of killing happens regularly in Africa and elsewhere. One elephant is murdered every 15 minutes. Why? Because society views animals as property. (Each day 153 plus million animals are tortured and murdered mostly for food.) Society creates demand for animal products and included in those products is ivory and body parts. There is also a demand by a non-vegan society for killing animals as entertainment. An uncomfortable truth we need to face is that the person who murdered Cecil is just like all of us who use animals as resources and who use animals for our pleasure. I hear some say what?!? How is my eating a “steak” or a chicken wing or eating icecream or eating my morning eggs have anything to do with the likes of this “psychopath” who killed that lion? The dentist who murdered Cecil did so because it gave him pleasure. We could be accused of similar motives. We eat animal products like meat, dairy, eggs, etc because it gives us pleasure but at the expense of many lives and yes, the dairy and egg industry is immensely violent. The fact is we certainly don’t need to eat animal products (or use animals for any other purpose) at all since we can *easily* meet our nutrition needs from plants (and other non-animal sources). The truth is that any animal we eat, wear or use is no less nor more morally important than Cecil. They love their life as much as Cecil the lion did and they deserve to not be treated as a “thing”. But back the issue of killing for entertainment. The killing of animals for entertainment and for “trophies” happens regularly. Putting it simply, while animals are viewed as property and while they are viewed as resources, no animal is safe. No single issue campaign nor any petition is going to end the property status of animals. No amount of money we throw at this issue, no “ban” or “boycott”, no politician we lobby is going to end the property status of animals. Only a general societal change of attitude, a paradigm shift away from our speciesist attitude towards nonhuman animals is going to end their property status and that means we need to recognise ALL animals as the sentient beings they are. We need to recognise their moral personhood and stop using them as “things”, as resources. 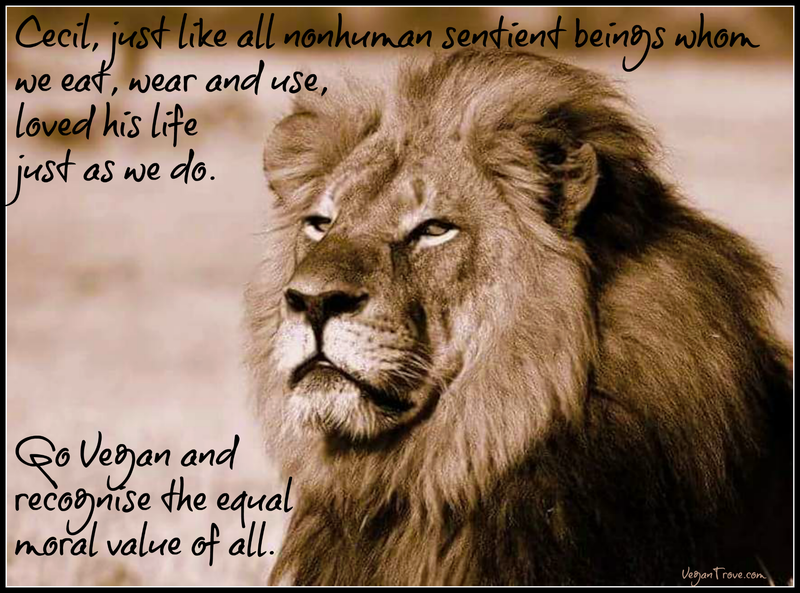 While what happened to Cecil is tragic and terrible, we need to open our minds to the reality that Cecil the lion is no more nor less morally important than any sentient animal whom we eat, wear and use. Chris Hedges (an ethical vegan and Pulitzer prize recipient) talks about the issue of moral compartmentalisation and ‪‎veganism‬ in his essay “All Forms of Life are Sacred“. In future, when we hear about tragedies like this one where a certain member of a species (that we fetishise) is murdered, let us remember that this particular nonhuman, just like all nonhuman sentient beings (no matter what species), deserves at least one basic right; not to be used as a resource, and deserves not to be treated as property. That means we need to embrace veganism. Veganism rejects the property status of all animals from every species. Veganism recognises the moral personhood of nonhuman animals. Can you imagine a world where the most vulnerable (nonhuman animals) are truly respected? And let us consider that if we respect the most vulnerable, nonhumans, this attitude most likely will then spread to encompass the most vulnerable of our own species. We can create such a world by first becoming vegan.